I love the holidays, and the special foods that I only eat once a year (sugar cookies!!) but I’m ready to get back to normal eating. I thought I would share a recipe that I think of as a holiday recipe, but really it’s a good winter recipe, especially for those of us that live where warm beach days are a possible in the winter. The directions below give a really nice presentation, but don't let that stop you from roasting some extra squash and throwing this together for lunch. I also suspect that dried cranberries or cherries would be a good stand-in for the pomegranate seeds. Heat oven to 425F (use convention roast if you have it). Toast the pecans (ok if oven is not to temperature) on a pan lined with foil. They will cook quick: 3 to 5 minutes if oven is hot. Watch closely! Let cool then wrap in the foil. Peel and cube the butternut squash. Microwaving the whole squash for a couple of minutes will make this easier. Place a piece of parchment paper on a sheet pan, put the squash on the paper. Drizzle with a couple of tablespoons of olive oil, and sprinkle with a bit of salt and toss with your hands. Roast until cubes are soft with some brown spots. This should take 15 to 30 minutes, depending on the size of the cubes and whether you are using convection or not. Sprinkle with thyme when they come out of the oven. Let cool. Make the sherry vinaigrette: put mustard, sherry, about a ¼ teaspoon salt and a good grind of pepper in a container. Using an immersion blender (or whisk), slowly add the olive oil. You won’t need all of this. If doing ahead, put everything into baggies and/or containers and refrigerate. Will hold for a couple of days. Let everything come to room temperature when you are ready to make the salad. Assembly: put a base of arugula on a platter, dress with a bit of vinaigrette (easiest to use your hands for this). Dress the squash with more vinaigrette (easiest if squash is in a baggie, just add ~ ¼ cup and work it around)… taste to get the right amount. 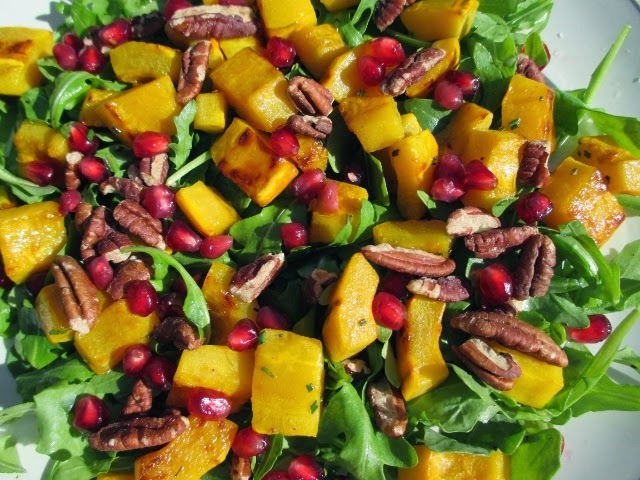 Put the squash over the arugula. Top with the pomegranate seeds and pecans.